I struggled to photograph these little guys, but don't judge a food by how photogenic it is! In this case, let's blame the photographer, and trust me when I say these one-bite morsels are a new favorite side dish! My coworker passed the recipe along to me in an email, mentioning that she reads the blog daily and has come to pick up on two of my favorite foods (sweet potatoes and kale) and that she thought of me when she came across the recipe. It didn't take long before I was whipping these up in my kitchen. She couldn't have been more right about nailing my favorites, and I was excited to try them in a new way. I prepped the mixture one night and then formed and baked the mini muffins the next day. In my eagerness to try them, I don't think I baked them quite long enough (though you can see from the crispy tops that I broiled them a bit too long), so they were rather fragile when I tried to remove them. Their fragility was no big deal, as I simply popped them one by one into my mouth. The red pepper flakes provided just the right amount of heat and the sprinkle of flax on top offered crunch (not to mention fiber!). 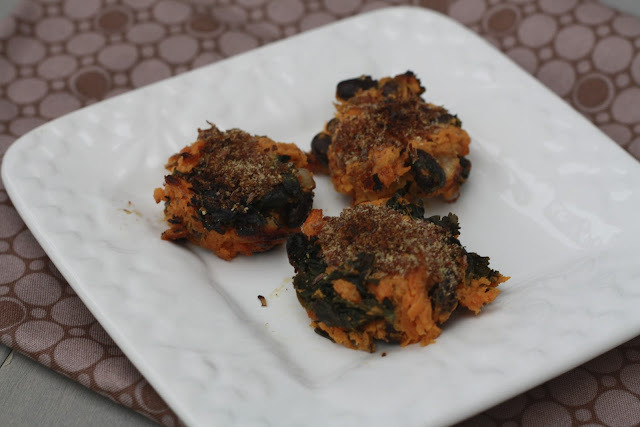 I can see this being a frequent repeat side dish in our kitchen! 1. Bring a large pot of water to a boil. Add potatoes and boil for 15 minutes, or until soft. Drain potatoes and mash them in a large bowl with the milk. 2. Heat a medium skillet over medium-high heat. Add olive oil, garlic, onion, and red pepper flakes. Saute for about 1 minute before adding kale and cooking until wilted. 3. 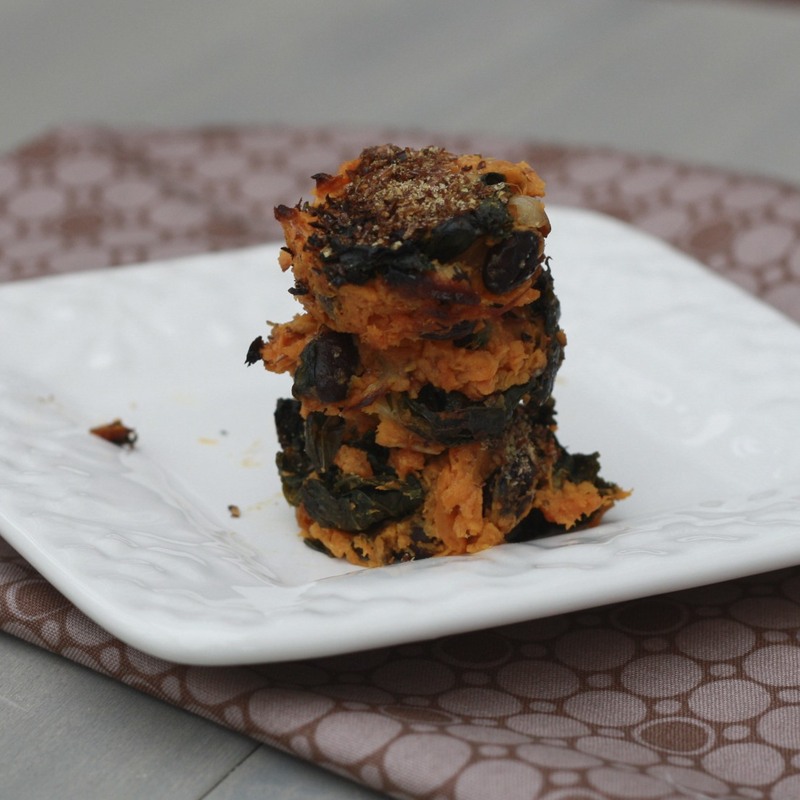 Add kale mixture to the sweet potatoes and season with salt and pepper, to taste. Fold in black beans and mix to combine well. 4. Heat oven to 450F. Grease a mini muffin pan. Evenly spoon potato mixture into the mini muffin pan, filling each to the top (I got 24 mini muffins). Sprinkle tops with ground flax seed. Bake for 20-25 minutes before broiling on high for a few minutes until the tops are golden and crunchy. 5. Allow tray to cool for 10 minutes before removing carefully with a spoon or fork.